There are two things I admire in a person. They champion a developing cause. When Kahneman started his work, the accepted wisdom was people are rational. When they don’t act rational it is because of emotions. In contrast, his research showed several errors are baked into our (two aspects) cognitive process. Kahneman showed people are neither completely rational nor selfish. There is even an anecdote (that he told the New York Times after winning the 2002 Nobel Prize in Economics) about a prominent philosopher dissed his work as “psychology of stupidity” (I wonder where this guy displays his Nobel Prize?). As he entered the current phase of his work (with all due respect to Dr. Kahneman, I am going to lump “hedonic psychology” in with the better publicized school of “positive psychology”) there was still modest support for the importance of positive psychology. In some circles it was considered counterintuitive. Again, he has done pioneering work on hedonic psychology – the nature, cause and perception of happiness. Picking up where we left off last post– here are the next two (collective) categories and some takeaways. Would you give up financial gains if you didn’t receive a fair share? Let me set the stage by saying a paper by Kahneman and Tversky, titled “Prospect Theory: An Analysis of Decision Under Risk,” is the most cited paper to appear in the academic (my emphasis) journal Econemerica. In other words, this is heavy (mathematical) stuff. So here’s a concise (usable) summary for we business people. We give losses more weight than gains. We are reluctant to abandon initiatives. We are most interested in relative gains and losses rather than final worth. We become biased toward things we are familiar with. We pass on proceeds if we don’t feel we receive our fair share. We accept exposure to what we think is low-probability events. We prefer certainty and are willing to sacrifice gains to achieve more certainty. Is happiness the new Holy Grail? 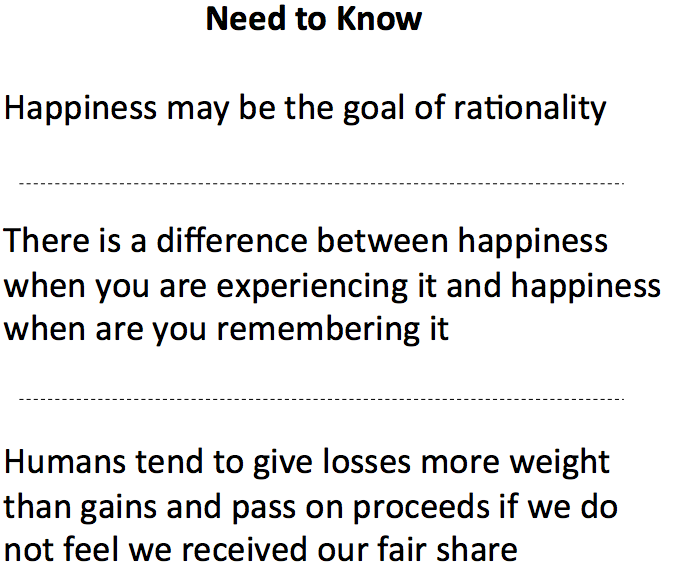 Kahneman seems to see happiness as the goal of rationality. 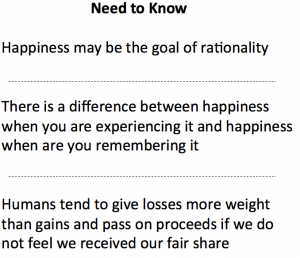 However – what I find most fascinating is his research showing there is a difference (my emphasis) between happiness when you are experiencing it and when you are remembering it. The latter is more relevant. In a business context, understanding how to (at least empirically) understand issues like the average household income that provides “happiness” can make or break a company. There are practical implications when you are trying to build a personal and corporate culture. Basically, you are assuming where people are content, in terms of earnings, thus stimulating creativity and innovation. Before closing – I refer you to previously cited work by Martin Seligman (and others) in this burgeoning area. I predict “positive psychology” could become one of the hottest areas as it relates to performance – I see it as becoming the Holy Grail of every businessperson. Seligman has even coined a more descriptive word for this state: ‘eudemonia.’ He describes that as a dimension – the pleasant life, the good life and the meaningful life. So what do you think? Does loss aversion, relative positioning and conservation show people are not always irrational or selfish? Am I correct by envisioning happiness as the new business Holy Grail or am I exhibiting some thinking errors? Let me know what you think.